With one week of recipe testing down it's time for another 30 Recipes In 30 Days update - if you missed the first post you can catch up here. I'm pleased to say that overall the challenge is still going well and I've managed to make four more dishes that I really enjoyed. I even discovered my new favourite vegan 'bacon bits' alternative! On day four I tackled my first baking recipe of the challenge with these easy vegan, gluten and oil free cinnamon cookies from Veggie Inspired. I love cinnamon so of course I opted to add the extra 1/2 tbs of cinnamon suggested in the notes section and they turned out really well. An unexpected bonus was discovering that these cookies are also brilliant for making ice cream sandwiches! Of all the soup flavours out there this combination has always been one of my favourites. Unfortunately the brands I used to pick up aren't dairy free so I decided it was about time I tried making my own! I followed a recipe from Yumsome (scaled down as the original makes 10 servings) and enjoyed with some gluten free bread. Recipe six of the challenge was taken from one of my favourite blogs for vegan cooking inspiration; Wallflower Kitchen. This tasty version of stuffed peppers has a nice spicy flavour and uses cauliflower in place of rice. The final recipe of the week was these vegan 'bacon bits' I made using a recipe from The Crunchy Chronicles. Not so long ago I tried making my own coconut bacon bits but wasn't overly keen on them. 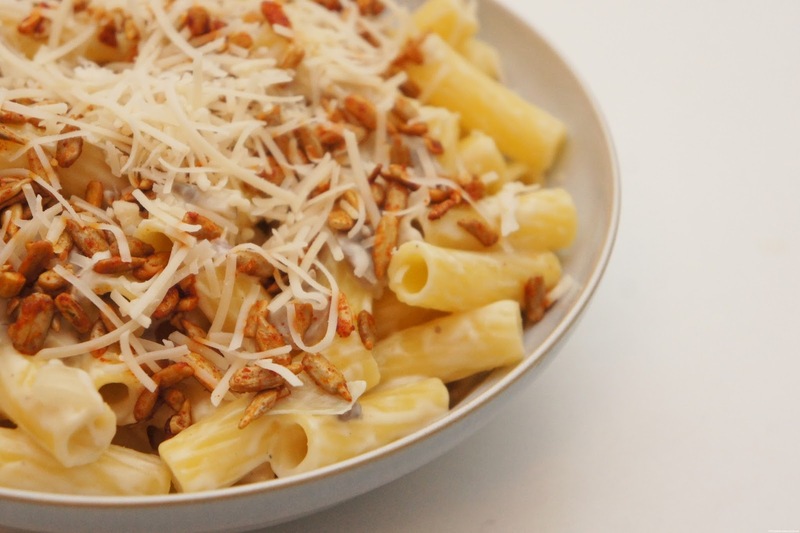 Karissa's clever recipe uses sunflower seeds in place of the coconut and they were the perfect addition to this pasta dish I created as a vegan version of carbonara. I'll definitely be making these again!